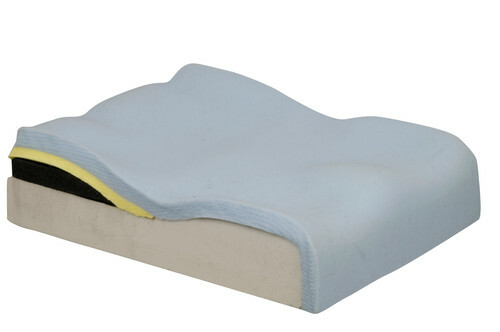 The JAY® Union™ is a versatile, comfortable, skin protection and positioning wheelchair cushion composed of a dynamic fluid and foam layering system, moisture resistant inner cover, and an anti-microbial outer cover. The Union's foam base is moderately contoured to encourage proper positioning of the pelvis and thighs. Added 1" lateral pelvic wedges offer superior lateral stability and alignment of the pelvis for more involved positioning needs. The Union features a top layer of soft, Visco memory foam, with an extra layer covering the Pelvic Loading Area. This combination creates the ultimate sitting surface that distributes weight for pressure reduction and maximum comfort. 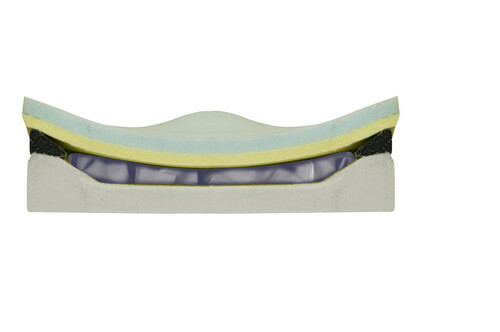 The JAY Flow fluid insert that lies beneath the Visco™ foam conforms to each individual's unique contours for even pressure distribution beneath the pelvis and a reduced risk of skin breakdown. For convenience and protection, the Union features a dual-cover system. The inner cover is water-resistant and easy to wipe off and clean, while its Aqua-guard zipper and anti-wicking thread protect the foam base from fluids. The machine-washable, stretch outer cover reduces surface tension and utilizes naturally anti-microbial, silver-impregnated X-static® fiber. A layer of 3DX spacer fabric promotes airflow and dissipates heat and moisture for additional skin protection.